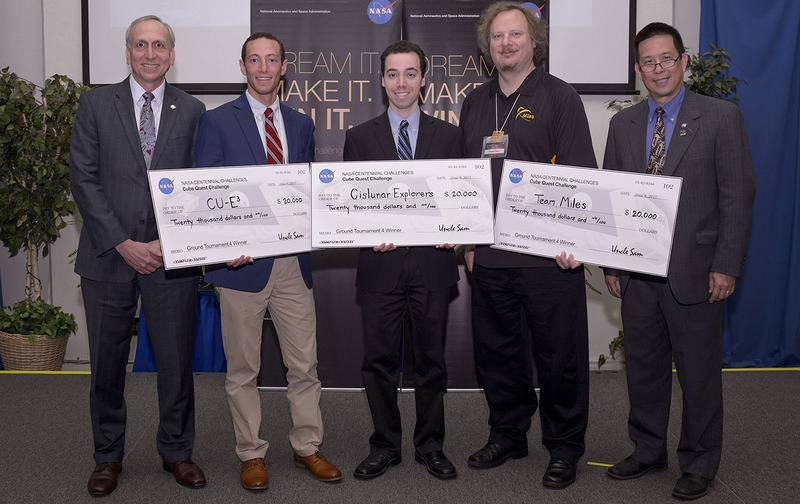 On Thursday, June 8, NASA announced the three winning teams of the semi-final round of the space agency’s Cube Quest Challenge. In addition to winning $20,000 each in prize money, the three teams have also secured spots to launch their spacecraft on Exploration Mission-1 (EM-1) – the first flight of NASA’s Space Launch System (SLS) with the Orion spacecraft. 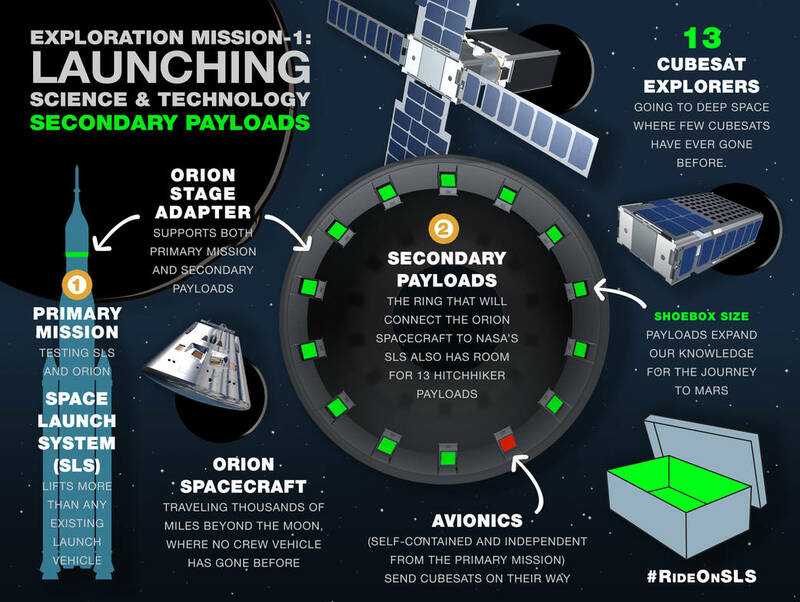 The CubeSats will be placed in the Orion Stage Adapter, the ring that connects the spacecraft to the SLS rocket, and deployed after Orion separates from SLS and begins its journey into deep space. The adapter is capable of carrying a total of 13 CubeSats. Once deployed, they will compete in deep space for a share of a $5 million prize in the final stage of the Cube Quest Challenge. Cislunar Explorers, Cornell University, Ithaca, New York: The team’s CubeSat uses a water-electrolysis propulsion system. By zapping water with electricity, the bond between hydrogen and oxygen can be broken, decomposing the liquid into a gaseous mixture that readily combusts. CU-E3, the University of Colorado in Boulder: The team is made up of students from the Aerospace Engineering Science Graduate Projects class. Their shoebox-sized CubeSat is designed for communications 2.5 million miles into space. Team Miles, Fluid & Reason, LLC, Tampa, Florida: This team of citizen scientists designed a breadbox-sized CubeSat that will be flown autonomously by an onboard computer and propelled by plasma thrusters. According to NASA, the final phase of the Cube Quest Challenge comprises two portions: the Deep Space Derby and the Lunar Derby. In the Deep Space Derby, teams must demonstrate communications from a range of at least 2.5 million miles (four million kilometers), which is more than 10 times the distance from the Earth to the Moon. The Lunar Derby requires teams to achieve a lunar orbit and compete for near-Earth communications and longevity achievements. Prizes will be awarded for orbiting the Moon, communicating the fastest and farthest, and surviving the longest. EM-1 is currently scheduled to launch in late 2019. The Deep Space and Lunar derbies will conclude one year after the CubeSats are deployed. The Cube Quest Challenge is part of NASA’s Centennial Challenges program. The challenge is managed at NASA’s Ames Research Center in Moffett Field, California.